This book is the first to provide English readers with a brief and comprehensive survey of economic life in Italy during the period of its greatest splendour: the Middle Ages and Renaissance. The wealth of Renaissance Italy was the product of centuries of growth, and the great Renaissance cities, Venice, Milan and Florence, were first and foremost centres of international trade, which taught the rest of Europe the rudiments of modern business techniques. 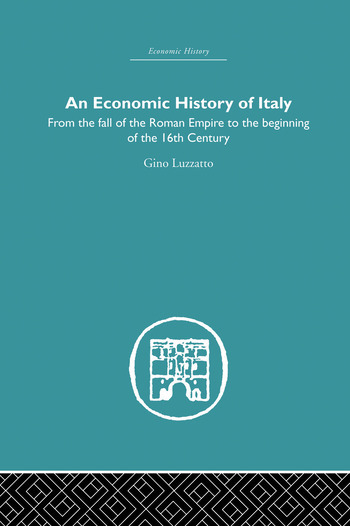 In a masterly synthesis, based upon a lifetime of study and research, Professor Gino Luzzatto, the greatest of living Italian historians, describes the main changes in Italian economic conditions from the end of the Roman Empire, when Italy ceased to be the centre of a European state, to the end of the Middle Ages when Italy lost the leadership of European trade and banking. The narrative chapters, which deal with barbarian Italy, feudal Italy and Italy in the age of the communes, are followed by a valuable analysis of medieval agriculture, industry, commerce and finance, in her principal Italian states. The range of discussion is wide and offers an excellent introduction to the economic history not only of Italy but of the whole Mediterranean region. This classic text was first published in 1961.